Florida Atlantic University (FAU) Transformations is the result of a multi-year academic and professional collaborative process to re-envision the design and policies for landscapes throughout the campus beginning with the College of Arts and Letters. Michael Singer developed this program while he was the Dorothy F. Schmidt Eminent Scholar for the College of Arts and Letters at FAU as a part of his “Creative Thinking in the Public Realm” seminar. At the core of Transformations is a series of visual, scientific and engineering studies demonstrating the improvement of aesthetics, ecological health, water quality, biodiversity and comfort of naturalized landscapes and retention ponds on FAU’s campus. 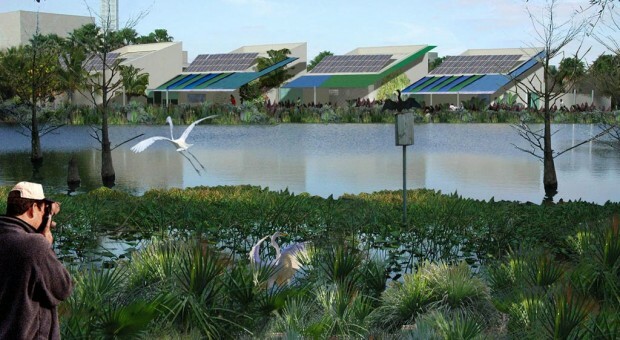 A series of conceptual designs focusing on regenerative design strategies were created for a number of campus courtyards, plazas and retention ponds. Over several years the project evolved in different ways, from engagement with the campus planning department to collaborations with engineering and business faculty and students. A proposal for a composting partnership with Whole Food Market Boca Raton (across the street) was developed to supplant chemical fertilizers on FAU‘s campus and save tens of thousands of dollars a year. Tobin Hindle a faculty member and PhD candidate at the time ultimately wrote his thesis on the Transformations project.